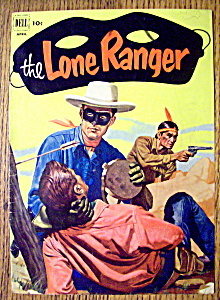 This vintage Lone Ranger Comic Cover-The Lone Ranger (Cover Only) from April 1952 is in very good condition. This Comic Cover measures approx. 7" x 10" and is suitable for framing. This Comic Cover features "The Lone Ranger & Tonto Rescuing A Cowboy Attacked By Indians".